I thought I would work on the October sneak peek blocks, but on Sunday my husband mentioned a girl who works with my daughter Katy, whom he had been visiting with a while back and discovered that she had no memories of birthday gifts growing up, except one time she was given a comb. She has had a hard life. Anyway he thought it would be nice to give her a gift for her birthday, which is tomorrow. My thoughts immediately went to a quilt as a gift. I remembered I still had some of the Sept. 2007 lotto blocks I had won…pink/ purple Ohio Stars. Katy said Kayla would like pink. I also had border fabric in mind with pink flowers and birds on it and Katy said Kayla like animals, so I decided I would do it. From the start this quilt has just been meant to be. I pulled out the blocks and the border fabric and decided a green sashing would be best. Right on top of my greens was the perfect green with white dots…enough for sashings and binding. Then I found a scrap of a pink that was great for the cornerstones. By bedtime Sunday it was all cut and up on the design wall. Monday was community quilting day for guild so I was gone most of the day, but I sewed after I came home in the evening and had it all sewn together but the top and bottom borders. The border fabric is a standard 44″ width. Being a very directional print and fairly large at that, and the quilt being 62″ wide I needed to piece the fabric for those borders. I wanted to match the designs in the fabric. Amazingly it went together perfectly on the first try…..the seam runs right down the center in each of these pictures of the border. Tuesday morning I attached the borders and found fabric and pieced the backing. I mounted it on the longarm and started quilting. I could have done a simple allover meander, but decided the the large simple blocks and sashings really needed a bock by block quilting. I meandered the border, did a heart chain in the sashings, heart in the cornerstones, and hearts in the start parts with straight line quilting in the background. It turned out quite nicely! The quilt is beautiful. That is one lucky birthday girl. 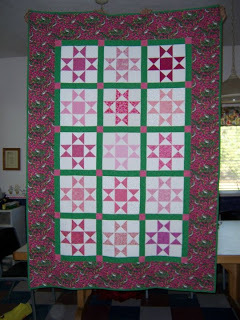 I love the colors/patterns you introduced to those pink Ohio Star blocks. How wonderful to give the joy of receiving such a wonderful gift to create a new memory of gifts and a pleasant association for that girl. How nice of you! Beautiful quilt! It's beautiful, she's gonna love it. Everything has just fallen into place because it is so meant to be!! Warmth on so many levels. You've done a fine deed. What a lovely story -and a beautiful quilt.